A diode laser uses semiconductor technology that produces coherent projection of light in the visible to infrared range. It uses a light beam with a narrow spectrum to target specific chromophores in the skin. Compared to other laser systems such as the Ruby and Alexandrite, the 800nm diode laser wavelength offers the deepest penetration levels and superior melanin absorption. These unique characteristics make the diode laser the most suitable technology for laser hair removal, enabling safe and effective treatment of all skin and hair types, in all body areas. Diode lasers use the principle of selective photothermolysis (abbreviated SPTL) to target specific chromophores in the skin, usually melanin or blood. The lasers damage the chromophores by selectively heating them while leaving surrounding tissue unharmed. When treating unwanted hair, for example, the melanin in the hair follicles is targeted and damaged which results in the disruption of hair growth and regeneration. 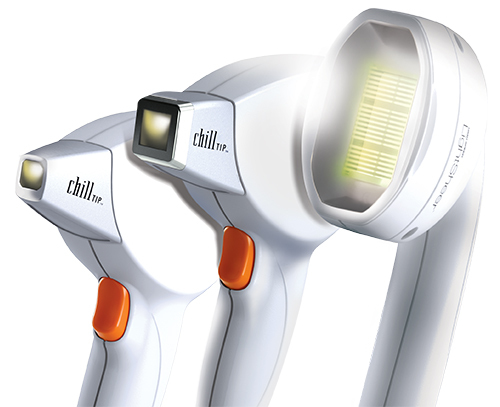 A diode laser can be complemented by cooling technology, or other pain reducing methods which improve treatment efficacy and patient comfort. Lumenis’ LightSheer diode technology by Lumenis has been validated in numerous clinical studies and peer reviewed articles. Our customers benefit from the LightSheer DESIRE features and enjoy high patient satisfaction. The LightSheer uses high-power diode technology that can deliver high fluence. This is combined with user-select pulse duration, effective contact cooling and compression for high-performance. The LightSheer also offers a 22 x 35 mm spot size which allows for greater depth of penetration and significantly faster treatment.